Malware like Zeus and its variants inject themselves into a user’s browser to steal banking information. This is a man-in-the-browser attack. So-called, because the attacker is injecting malware into the target’s browser. 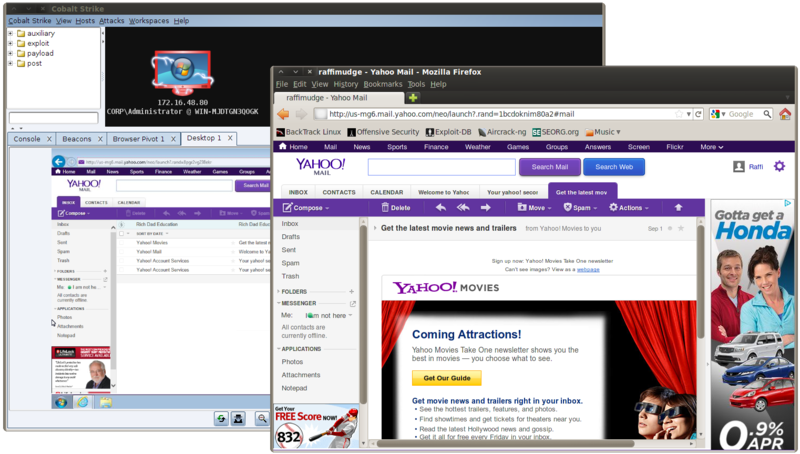 Cobalt Strike offers a third approach for man-in-the-browser attacks. It lets the attacker hijack authenticated web sessions–all of them. Once a user logs onto a site, an attacker may ask the user’s browser to make requests on their behalf. Since the user’s browser is making the request, it will automatically re-authenticate to any site the user is already logged onto. I call this a browser pivot–because the attacker is pivoting their browser through the compromised user’s browser. Cobalt Strike’s implementation of browser pivoting for Internet Explorer injects an HTTP proxy server into the compromised user’s browser. Do not confuse this with changing the user’s proxy settings. This proxy server does not affect how the user gets to a site. Rather, this proxy server is available to the attacker. All requests that come through it are fulfilled by the user’s browser. It’s site agnostic. You don’t have to customize the attack for each site you want to target. This is good, because penetration tests are time constrained. The browser pivot is a very visual demonstration. You open your browser and go to a sensitive site. Voila, you’re there as the user. This is a very powerful way to demonstrate risk to an executive and convey what an advanced threat actor could do once they compromise a system. It’s hard to detect. All of the attacker’s activity is mixed in with the user’s legitimate activity. All requests come from the same browser. How do you sort this out? If you’re a penetration tester replicating an advanced actor, you want capability in your kit that challenges your customers. If you’d like to see Browser Pivoting in action, take a look at this new video. It demonstrates how to browser pivot into a webmail account, a local Wiki secured with HTTP server authentication, and a local Wiki secured with a client SSL certificated stored in a password protected keystore.